This one bedroom, two bath unit has 2 lanais and sweeping ocean views down the greenbelt in two directions. To the south west is the ocean with plenty of opportunity for whale watching in season and the island of Kahoolawe with the snorkelers favorite, Molokini, in front. To the east is the ever changing face of Haleakala. 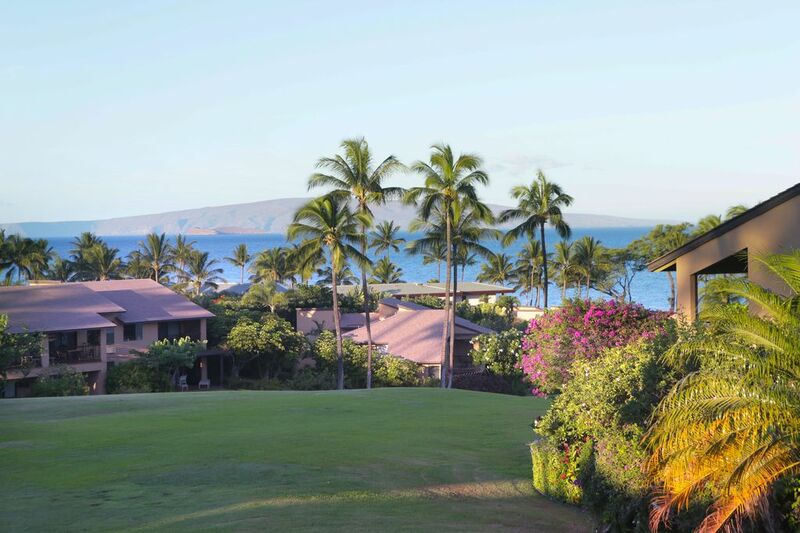 The quiet sunrise and sunset views offered make this one of the most relaxing locations in Wailea. A walk of less than two minutes down the green belt takes you to the beachfront pool where there is access to Wailea's Keawakapu Beach. 32D is in an exceptionally quiet location upstairs in a 4 unit building on the central green belt of Ekahi. It is also METICULOUSLY CLEAN. It has been beautifully remodeled and features a cove ceiling in the bedroom, central air, cathedral ceilings in the living room and bedroom. Provided in the condo is a booster seat and pack-n-play and a few toys if you are traveling with children. Dave and I live in San Diego, CA but had a great opportunity to live in Hawaii for a summer. We spent every weekend on Maui we just loved it so purchased a vacation rental. We just love spending time here and Ekahi is our favorite location. Our friend listed her condo and we just loved the location on the large greenbelt the Molokini view and easy of walking to the beach. We try to come over when ever it is vacant but that is not as often as we like. However, we really enjoy sharing this home away from home with our guests. It is really one of the best and we look forward to sharing it with you. A few year earlier we were able to purchase a Wailea condo but not beachfront. We always knew we really wanted an Ekahi ocean view unit and now look forward to sharing it with you. The ocean view of Molokini island is just fantastic and being on the greenbelt is really peaceful. Having no road noise, just the sound of waves is music to our ears. On top of all this, the previous owner did a very professional remodel and interior design to include original Hawaiian art. This really makes this unit feel like Hawaii. Hope you enjoy it as much as we do. Fabulous location. Wonderful condo. Can’t be beaten! We are very happy to share our home with you. You are the best and we look forward to your return. Lovely to sit on the balcony, the grounds are beautiful and peaceful. The condo was well-equipped, clean, comfortable, everything works... We had no problems at all once we arrived. The booking process was smooth and communication with the owner was great... in short, we loved it! Thank You! We are so glad you loved staying in our home and found all that you needed. We welcome you back anytime. Thank you for taking great care of the condo. Thanks for staying with us and I welcome you back at any time. We enjoyed this condo, especially with all the beach toys and extra supplies that were left. The decor was very tasteful and beds and pillows were super comfy. Yes, we would come back to this unit. Mahalo. Thank you for staying staying with us. Do keep us in mind for your next visit. It guest like you that we always welcome back! This condo has everything you need! From being incredibly clean and well stocked on the inside (home away from home) to the VIEWS, this place has it all! Within walking distance you have pools, silky sand beaches, snorkeling, kayaking, a great beach trail, and that's the short list! A True Gem! We are so glad you enjoyed your stay. Thank you for your kind word and please come back again. You are always welcome! Walk to one of the nicest beaches in Wailea- Keawakapu Beach. Snorkel with the sea turtles, explore the tidal pools, boogie board, or just relax on the beach or at the ocean side pool. The Wailea beachfront walking path is just a few steps down the beach which will take your for morning coffee, for a wonderful dinner at one of the many restaurants, or to just take in the beauty of Wailea's beaches. Once a reservation is confirmed you will need to email us your address and a rental agreement will be emailed to you for your signature and initials.